(2016). Gravimetric storage capacity of Hydrogen on C24H12 Coronene and its Si substituted at 298 K, a Monte Carlo Simulation. International Journal of Bio-Inorganic Hybrid Nanomaterials, 5(3), 189-194.
. "Gravimetric storage capacity of Hydrogen on C24H12 Coronene and its Si substituted at 298 K, a Monte Carlo Simulation". 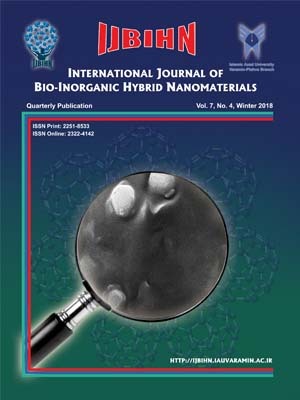 International Journal of Bio-Inorganic Hybrid Nanomaterials, 5, 3, 2016, 189-194. (2016). 'Gravimetric storage capacity of Hydrogen on C24H12 Coronene and its Si substituted at 298 K, a Monte Carlo Simulation', International Journal of Bio-Inorganic Hybrid Nanomaterials, 5(3), pp. 189-194. Gravimetric storage capacity of Hydrogen on C24H12 Coronene and its Si substituted at 298 K, a Monte Carlo Simulation. International Journal of Bio-Inorganic Hybrid Nanomaterials, 2016; 5(3): 189-194. In this study, the radial distribution and gravimetric storage capacities of hydrogen on coronene (C24H12) and its Si substituted forms, C24H12, C24-nSinH12 (n= 4-24), have been investigated at 298 K and 0.1 MPa (standard situation) using (N,V,T) Monte Carlo simulation by Lennard-Jones (LJ) 12-6 potential. The results show that the increase of number of silicon substitution doesn’t have any effect on the value of Radial Distribution Function (RDF) of H2. Also, the symmetric silicon substituted structures have more RDF than asymmetric types. The magnitude of hydrogen radial distribution on the surface of C6Si18H12 is larger than other structures. The maximum value of radial distribution, gravimetric storage capacity and weight percent of hydrogen storage under identical temperature and pressure conditions are 0.0434, 0.0612 and %6.12 for C6Si18H12 structure at 0.73Å. On the basis of results, the coronene with 18Si can be suggested as a choice for hydrogen container compared with other its Si substituted forms.